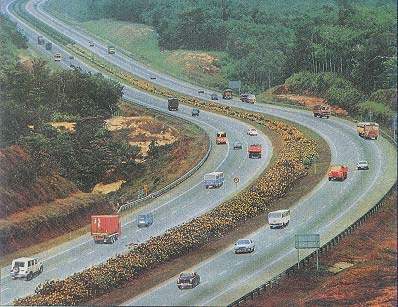 View of the Khandala section of the new Mumbai-Pune Expressway during construction. The Mumbai-Pune Expressway has three lanes in each direction. 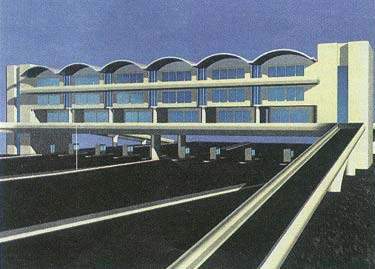 Model of a tollgate on the Mumbai-Pune Expressway. Map of the entire Mumbai-Pune Expressway. 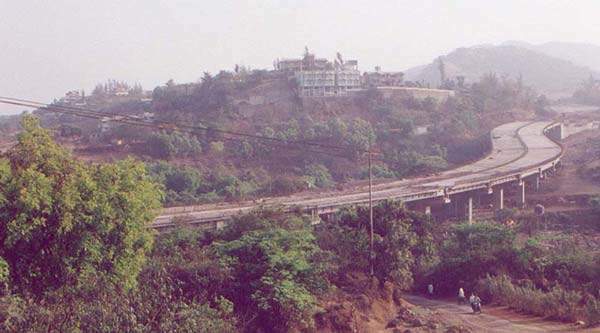 The Mumbai-Pune Expressway, arguably the most ambitious transport project undertaken by the Government of Maharashtra, was opened to traffic on the 5 April 2000. Mumbai (Bombay) is the commercial capital of India and is growing significantly in size and population. In the same way, Pune, the cultural capital of Maharashtra, is growing into a major industrial and commercial centre, hence the importance of the Mumbai-Pune road. Due to an increase in traffic, it became necessary to build a new and independent Expressway. At the time the proposal was put forward, an average of 400 people per year were killed due to accidents on the Mumbai-Pune National Highway. In 1990, the Government of Maharashtra appointed Rites and Scott Wilson Kirkpatrick, UK, to carry out feasibility studies for the new Expressway which is operated on a toll basis. Rites submitted their report in 1994 with the estimated cost of the project at Rs1146 crores ($240 million). 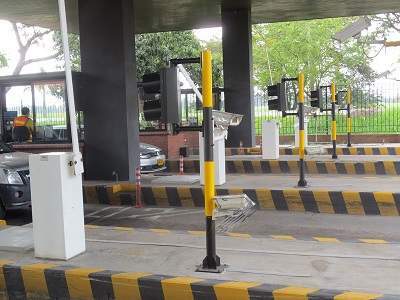 The Government of Maharashtra entrusted the work of the expressway’s construction to the Maharashtra State Road Development Corporation Limited (MSRDC) in March 1997 on a Build Operate and Transfer (BOT) basis, with permission to collect tolls for 30 years. The environmental clearance from the Ministry of Environment and Forest, Government of India was received in October 1997. The clearance was received in November 1997. For the purpose of preparing detailed estimates, designs and preparation of bid documents, the work was divided into eight sections. To facilitate proper supervision, six international consultants were appointed. Initially, tenders for four sections were invited on 11th November 1999. Due to wide publicity, 133 tenders were sold and on 18th Dec 1997, 55 tenders were received. After technical and financial evaluation, tenders were accepted and work orders were given on 1 January 1998 to four contractors. Thereafter, tenders for the widening of Khandala Ghat and the Lonavala to Khandala Bypass works were invited. 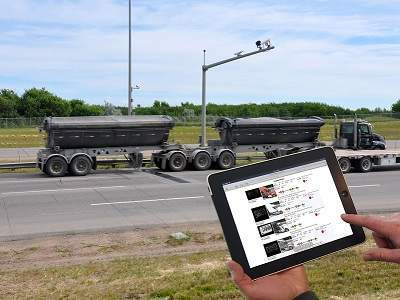 The tenders were received on 24 August 1998 and work orders were issued on 4 September 1998. For the last section of the Expressway work tenders were invited and work orders were issued on 24 March 1999 and 6 April 1999. The total project cost, including escalation and interest during the construction period, was valued in the region of Rs1,630 crores ($350 million). The expressway has six lanes divided at the centre by a 7m-wide divider. An extra lane was provided on each side as a hard shoulder. The road is designed to cut down travel time between Mumbai and Pune to three-and-a-half hours at a speed of 70km/h to 120km/h. The expressway has four-lane-wide tunnels at five locations with a total length of 5,724m. There are separate tunnels for traffic in each direction and the cost of the tunnels was about Rs200 crores ($40 million). The tunnels on this Expressway were provided with modern facilities for ventilation, lighting and fire fighting vehicles. This work was entrusted to Kokan Railway Corporation Ltd on 8 December 1997. In order to complete the work on time, the latest construction machinery was used. The cost of this machinery alone was about Rs300 crores ($60 million). The main machinery used was as follows: a slip form paver, used for laying concrete road at 4m wide and 35cm thick at 1m/min; a large size crusher which has the capacity of breaking metal at rate of 40 to 50 trucks/hour; a sand manufacturing machine, used to produce artificial sand, as the large quantities of sand required for the project were not available; concrete transit mixers and dumpers, used for transportation of concrete from batching plant to laying site; and wagon drills for blasting of rocks. These drills can bore holes up to 10m deep. Apart from the above machinery, a large number of vibratory rollers, spreaders, graders and dumpers were used for earthwork.